QUEEN’S PARK – Haldimand-Norfolk MPP Toby Barrett has reiterated his call for compensation to businesses and homeowners in the wake of the Argyle Street blockade. Barrett concluded his first question by asking, “What steps have you taken to arrange compensation – as has been done in the past – for Caledonia and area homeowners and businesses.” He directed his questions to the acting premier on Wednesday because Premier Kathleen Wynne was absent to testify in the Sudbury by-election trial. Not satisfied with the answer from the Minister of Indigenous Relations and Reconciliation that basically just recounted what had occurred, Barrett continued his line of questioning back to the acting premier. “On Sept. 2, a local newspaper reported that when a fire was set on the Southern Ontario Railway in Caledonia, a Caledonia fire truck was not allowed to pass through the barricade, not allowed to put it out,” Barrett said. Again, the government dodged the question and did not address the issue of compensation, saying what occurred 10 years ago was different since there was peaceful resolution this time. Barrett attempted to interject that it’s now been 11-1/2 years. Barrett has indicated he will continue to push for compensation for Caledonia businesses and homeowners. Mr. Toby Barrett: To the Acting Premier: From August 10 to September 4, Labour Day, the main thoroughfare of Caledonia was blockaded, putting businesses and homeowners through psychological and economic hell. More specifically, many customers faced a six-mile detour, businesses lost 25% to 60%, and staff were let go or had their hours cut. Homeowners expressed concern about property values and compromised service from firefighters, police and ambulance. However, on September 1, your government announced it was standing down from dealing with the Caledonia blockade. Acting Premier, what steps have you taken to arrange compensation, as has been done in the past, for Caledonia and area homeowners and area businesses? Hon. Deborah Matthews: To the Minister of Indigenous Relations and Reconciliation. Hon. David Zimmer: The member opposite is quite correct: There was a blockade that was put up a couple of weeks ago. Our ministry, the Ministry of Indigenous Relations and Reconciliation, took that situation very seriously, as did the Six Nations elected council and the Haudenosaunee Traditional Confederacy. I can assure the members opposite and everyone in this House that after a series of negotiations with First Nations, with the Ontario Provincial Police and with the various ministries that blockade was peacefully ended. I want to congratulate and recognize the hard work of the Ontario Provincial Police in working in a way that was respectful of the Six Nations, the Haudenosaunee and the government of Ontario. The Speaker (Hon. Dave Levac): I’m going to allow the supplementary. Mr. Toby Barrett: This past month was a nightmare yet again for people in the Caledonia area, and I’ve dealt with many ministries. On September 2 a local newspaper reported that when a fire was set on the Southern Ontario Railway in Caledonia, a Caledonia fire truck was not allowed to pass through the barricade, not allowed to put it out. Acting Premier, my question is: Are you working with the federal government, as has been done in the past, to compensate residents of Caledonia? Hon. David Zimmer: Thank you again for that question. The point here is that 10 years ago there was a situation in Caledonia that went on and on and on, and there were real issues of public safety. This time, there was a blockade that went up and issues developed. But the point, again, is that all persons involved in the resolution of that blockade, be they police, fire responders, first responders, the ministry of indigenous affairs or the Ontario Provincial Police—it was resolved peacefully. That’s progress. That’s in the spirit of reconciliation. We will continue to deal with issues involving matters that First Nations raise, wherever in the province. We will deal with them in a respectful way and in a peaceful way to a constructive resolution. I would like to comment on the Hon. David Zimmer's comment that, "it was resolved peacefully. That’s progress. That’s in the spirit of reconciliation." REALLY! That is what it is? Actually it is Six Nations calling the shots and everyone else standing by. It is by sheer luck that tragedy did not occur since paramedics would have been blocked from getting to West Haldimand Hospital in Hagersville. All is fine isn't it Mr. Zimmer, when one sees things from a Toronto perspective. How about living in the south side of Caledonia during one of these blockades and see how you feel then. Reconciliation, hardly!. The OPP caught the thugs off guard and exercised an excellent maneuver to disperse the scattered "protesters" - otherwise we would still be blocked in. By in large people in Toronto don't have the vaguest sense of what it is like to live next to a criminal compound with no secure walls or gates. Thank you to Mr. Barrett. We are blessed to have him as our representative. Next election with a Conservative Government, we will have far more sympathetic ears in Toronto. Since I just arrived home, and being well and truly jet lagged, I did my best with the bad lighting conditions at that time of day to at least get some preliminary photos of "the DCE entrance way". So with apologies for the less than ideal quality of the visuals, I will post the first pictures I took of the Douglas Creek Estates (Kanonstathon) entrance, the hub or "operations center" of the recent "protest", as it is established today. The barricade (location from 10 August to 4 September) was directly behind me - the photos being taken from Argyle Street South today. Photo 1: This vantage point shows Surrey Street looking west, including the right side of the gate. Of course looking ominously at us is the stub of the Hydro One tower which had been pulled across Argyle Street South (poised to spring into action once again). Notice the Mohawk Warriors flag on the right side of the tower, and what may be a Confederacy (Six Nations, not Dixie "stars and bars") flag on the left (too limp to make a diagnosis) - staring defiantly at those who would dare approach. It is also noteworthy that there is a set of gang lights attached to a portable generator (can be towed). This will give off a considerable amount of light for "work" in the dark. The old wooden shack, the only structure remaining from the "old days", can be seen peeking over the top of a group of awnings - tents. I cannot confirm that there is a "padlock" placed there by the OPP. There is a chain ................... clearly further investigation is required. Photo 2: Here we see the left side of the gate, and a better view of the awnings and tents scattered around the property. Picnic tables and garden chairs provide a festive look. Many of the items appear to be high quality (expensive) - I wonder who paid for the gear. I also wonder how they deal with the ticks. Photo 3: The banner seen at the blockade on the Caledonia bypass is now draped over the fence to the left of the gate. It says, "Honour Our Treaties, Ya Big Meanies!" Someone seems to have a semblance of a sense of humour. Photo 4: It is hard to put into words the aesthetically pleasing vista of the southern entrance way to Caledonia. Just beyond the culturally significant smoke shop, one finds the enchanted scenes that characterize the DCE property. Above is a scene somewhat reminiscent of the Cinque Terre in Italy, with a view reflecting the Old World charm that visitors to the DCE can expect - much to the envy of our neighbours in Hagersville and Cayuga. The shack can be seen in the far left of this picture, along with an array of tents behind it. On the north side of Surrey Street (right side of photo) we can see that some sanitary needs of the occupiers is supplied by two "Johnny on the Spots" or similar outdoor toileting facilities. It is a bit creepy not to see any wash up area - although it may simply be hidden. There are no town services to the site (the occupants destroyed all the houses on site and are left with "the shack"), so everything must be brought in. Also behind (to the west) of these blue porta potties is another cluster of tents. Across the road from the complex (on the east side of Argyle Street South) were two Ontario Provincial Police cars pointed at the front gate. I waved, and they waved back. I waved and sent my greetings to two middle aged males who came to the gate at DCE. They seem to have recognized me, all I heard was a groan (sort of "oh no, not him again" type of groan), and they walked away. Throughout the whole ordeal of the August 10th to September 5th 2017 blockade of Argyle Street South in Caledona, I thought about the organizers who were there most every day, and kept asking myself, "How are these people able to show up every day to a protest? Don't they have jobs that require their presence? Of course some of the older ones may have been retired or independently wealthy, and some may have been funded by the Haudenosaunee Confederacy Chiefs Council (HCCC). Professional Protesters: It is a well known fact, as I have blogged about time and time again since 2013, that the HCCC has bilked millions of dollars from the green energy corporations such as Samsung by convincing them that they had treaty rights (there is no treaty that covers Six Nations, as I have spoken about time and time again with postings of the original documents), and that there is unsurrendered land in the Haldimand Tract (again, I have shown that this is a false assumption by using the documentation signed by the Chiefs in Council), and that they are the legitimate government of the Six Nations people (this false assertion was at the root of the recent protest). No one outside this group at Six Nations appears to know where the money went. The HCCC have never opened their books to the Community (which has been but another thorny issue here abouts). They could have used some of the millions of dollars to pay the protesters to keep vigil at the barricades. The Settlement: However, one of my relatives reminded me that a protest organizer is likely still living off the avails of a "settlement" with a hospital in Hamilton - one that was very controversial. As is often the case, instead of dragging the matter through Court, the hospital provided an undisclosed sum in a "settlement". Virtually all of us working in the system believed this person had bilked "the system", and in the process ruined the careers of a number of health care professionals. I guess this person to this day has been able to live with themselves, and not worry too much about the considerable collateral damage. Who is this person? I am not going to open myself to litigation by an individual who would drag anyone through the Courts until they cried "uncle". What I will do is cite "redacted" facts, those that I recall, those that likely can be verified by an inquisitive reporter who has the backing of media conglomerates. My point in all this is to expose the background of the parties orchestrating the unconscionable acts which have had such a negative impact on Caledonia. Here is what I recall, assisted by the recall of my relative. While working as a health care provider in what is today the Hamilton Health Sciences system, a group of 7 hospitals and partner facilities "offering specialty care to people throughout the entire life cycle" (click here), I became familiar with one of the protest organizers. Although the matter was covered extensively in The Hamilton Spectator and on CHCH TV news, since this occurred in the early 1990s, in the days before the Internet as we know it today, google searches are going to be unproductive. The data resides in the archival files of the Spectator on microfilm, and in the minds of many of us who were working in the health system in Hamilton at the time. 1) The person brought their aged mother to a hospital in Hamilton with symptoms of cardiac failure. 2) During the mother's stay, the family (led by the 2017 "protester") claimed that the hospital was "racist" since the hospital was unable to provide a "translator" for the mother who allegedly only spoke Onondaga. Of course Onondaga is a dead / dying language at Six Nations and so the demand was unreasonable. Also to the best of my knowledge the mother spoke English; and it occurred to me at the time that if there was a concern, why did the person or other members of the family not assist here. 3) The mother, died of cardiac failure; but the family believed that the death was caused by a Tylenol allergy. 4) The family initiated a law suit, where, during the inquest experts testified that there had been no documented cases of "Tylenol allergy". Also the family claimed that their mother did not speak English and did not understand that the nurse was telling her she was being given Tylenol - which if true would be highly important. However my relative was one of the nurses who gave the patient Tylenol (there was a doctor's order), and claims that the patient understood what she was given, and responded in the affirmative when asked if it helped any with her pain. 5) Then, as now, it is often best for those institutions or corporations accused of anything, especially when the "race card" is in play, to simply "settle" and avoid further litigation. 6) The family received a massive "out of Court" settlement. 7) Blame (since there needs to be a scapegoat) was ascribed to the nurse who happened to be on shift at the time the mother died. 8) There was massive fallout within the system including resignations of excellent health care professionals who were dragged through this "no win" situation. Hence, it is likely that the protest organizer is still living comfortably on the funds obtained from the hospital, and would have ample time to orchestrate protests. The above is based on memory (of two persons) and if there are errors, I apologize in advance, and will be pleased to make any necessary corrections. I have not, nor will I, name the person or family discussed here. The Aftermath of the Caledonia Blockade Summer 2017 - What Have We Learned This Time? Now that a sense of normalcy (or an approximation since we live in Caledonia) has returned to the area, we can begin to ask some questions and formulate some potential solutions - based on the belief that most of us don't want to see a repeat of what I have described in the last half dozen postings to this blog. Please read the whole editorial, entitled, "The Spectator’s View: Tolerance for illegal protests must have limits" here. The above cartoon hits the nail right on the head! 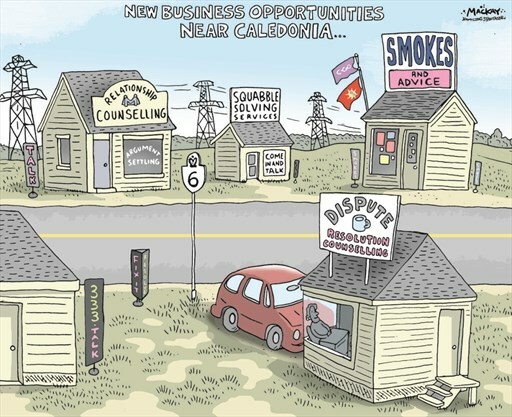 The cartoonist, Graeme MacKay, has a whole series of cartoons focusing on Caledonia - they are exceptional, and hilarious. To see the collection click here. The Six Nations Helped, But: There is really only one exception I would take concerning the well written and well thought out editorial itself, and that is the "partially correct" statement that the situation was kept in check because there was pressure from Six Nations on the "protesters". Indeed that was true, and the main core came from the business people along Sixth Line on the Rez, who, due to the blockade, were hurting badly as their profits dwindled to unsustainable levels. They had a significant influence on the perceptions of others on the Reserve. The reality is that perhaps 20% of Six Nations are supporters of the Haudenosaunee Confederacy Chiefs Council (HCCC), and they are well aware that with dwindling Longhouse membership, they face the potential of extinction as a group in the very near future. Maybe 20% are supporters of the Six Nations Elected Council (SNEC), with often only 3% of eligible voters turning up for the election of Councillors. The rest are somewhere in the middle, somewhat apathetic, and / or sit on the fence. There is complete disunity in relation to who should be considered the "legitimate" representatives of Six Nations - but as is so often the case, the loudest voice gets heard. So I am not about to give Six Nations a pat on the back here, it was largely (but not entirely) self interest that ensured that this "protest" would make no headway and lose support with each passing day. I can assure one and all that there are thousands on the other side of the Rez line (Oneida Road) who, given the right circumstances, and an issue that would galvanize broader support, would once again come together with cars, trucks, heavy equipment, ATVs and motorcycles pouring down Sixth Line to "do battle". It would only take a different dynamic, then the telephone tree and social media would kick into gear and it will once again be "us against them" - as was the case in 2006 and largely from then until August 10th. The good news is that many on Six Nations are jaded in relation to the methods of protest. Also major protests are likely to be localized. The bad news for us, it is localized to the eastern end of the Reserve - yes proximal to Highway 6 (from Hagersville to Caledonia). While some "intense" activity might occur on the north side of Caledonia, logistically there will not be the likelihood of thousands participating when you have to go cross the bridge and thread your way through well established neighbourhoods to reach the site. The OPP could "head this off at the pass" and so it would fizzle out fairly soon since key resources would not be available. So forget about heavy equipment etc. The south side of Caledonia will always be the theater of choice for any mass protest - it has all the right ingredients - and it all boils down to geography. Lucky us! Caledonia is chronically caught in the middle of matters that have nothing what so ever to do with them. We are innocent pawns, and have to depend on the actions of our Haldimand Mayor and Councillors, and the OPP - but generally this means just allowing the situation to play out. We are ignored by the Federal and Provincial Governments (with few exceptions, such as our local MPP). Correct Assertion re OPP: The main point of the editorial, that illegal protests should not be met with an OPP response of "standing down", is spot on. Ever since the "Dudley George affair" at Ipperwash, the OPP have done everything in their power to keep out of any altercations or illegal actions which involve "Natives". The situation got so bad in 2006 that they would not even send out officers to rescue one of their own stranded in the no - go zone. Yes, we still have a two - tiered policing system. Some actions will get a local from Caledonia arrested on the spot, an example carrying a Canadian flag near the Douglas Creek Estates - which is seen as a provocative act. However those designated as "Native" can prance around the same area with a Mohawk Warriors flag and essentially be ignored by the OPP (at least in the past). So when Caledonians see Six Nations Confederacy (purple and white) and Mohawk Warrior (red and yellow) flags flying day and night at DCE, most of us just see "red" and think "double standard", hypocrisy - this based on our experience from 2006 to about 2014 (when things became more quiet at DCE) - prior to the renewal of conflict in August of this year. The threat of arrest is very effective in deterring criminal protest acts - as long as there is not the possibility of huge "reinforcements" streaming in from the Rez as happened in 2006. That need NEVER happen again with the proper preparations (e.g., being proactive in blocking key access roads). It is important to note, however, that if the criminal act is something significant such as assault or damage over say $5,000, and enough proof can be obtained (e.g., videos), the Six Nations perpetrator will be arrested later either by the OPP, or on their behalf by the Six Nations Police. The "Native" will then be charged, held in custody, a Court date set, and if the evidence is compelling, the person will be found guilty and fined, jailed, or more likely given a warning. Based on the highly efficient and tactically sound approach used to dismantle the Highway 6 Bypass blockade on 5 September; and the rapid response to the attempt to blockade both the railway and the bypass, maybe we are in the process of seeing a "new and improved" OPP, one which will do us proud, I need to see a little more evidence of this. Suggestions: I will make a direct request to the OPP, the next time (there will be a next time unfortunately) please step in immediately to clear the road (Argyle Street South) and arrest those who are in the process of committing illegal acts on the spot. This would indicate that the OPP I once respected was returned to the Province. Perhaps moving past the unfortunate Ipperwash situation and simply applying the same law in the same way to each and every person would go a long way to meeting that end. If circumstances would be more favourable by a slight delay, that certainly makes sense. If for example, it means blocking 5th, 6th, and 7th Line with the help of the Six Nations Police, as well as the junction of Argyle Street South and the Caledonia Bypass - that would probably be a more productive approach - and we can change "immediately" to "as soon as all the ducks are lined up in a row". If there is a choice, operations after dark, and in the rain, will have a greater chance of success. The use of drones and a "ghetto bird" (helicopter with a night sun) or even better two, will also help ensure what situation might await - especially when used with bull horns. The chopper also has a psychological effect, and sends the message that arrest is immanent - and will likely send all but the most stubborn scurrying. If a bearcat and well supported SWAT team can be arranged, so much the better. The point is that negotiation does not work with these "land protectors" (thugs), history has taught us this over and over. The Protesters Presently at DCE: The disgruntled "protesters" have returned to their "headquarters", so now again assemble on the other side of the gate at DCE to "lick their wounds", and plan their next move - like snakes coiled and ready to strike. The "weapon of choice", when action is taken, will of course be the remnants of the Hydro One tower which stands at the ready, by the gate, poised to spring into action (or more correctly be hauled 50 feet to the middle of Argyle Street South). I lived through the Hagersville Tire Fire of 1990 where 14 million tires burned for weeks and we were under constant threat of evacuation. The fire was ignited by a group of young worthies from Six Nations (see here) - who did jail time for their misdeeds. Back in those days it did not matter if you were from Six Nations or Hagersville, if you did the crime, you did the time - no double standard. The "tire fire technique" was pressed into service by these great "land protectors" again during the 2006 mega conflict, and on numerous other occasions which have received less attention - and apparently tire fires were part of the plan for the Highway 6 Caledonia bypass. Indeed, as per the question posed in the heading to this posting, we have learned that the Six Nations "protesters" are characterized by considerable "continuity" in their behavioural repertoire (they have little imagination, are highly predictable, and possess little of substance in their toolkit). Will the Conflict Play Out at the Demolition Derby at the Caledonia Fair? : For those who are aficionados of the arts and fine wine, you might want to attend our annual "demolition derby" at the Caledonia Fair (28 September to 1 October 2017) - click here. At both the small car and full size car events (not so much with the kiddie cars), the Caledonia and the Ohsweken (Six Nations) teams have the opportunity to go at it and bash their opponent's vehicles to a smoking mass of crushed steel. Sometimes the animosity between communities appears to take on a very personal aspect - perhaps this year even more so. We shall see. This just in: I have it on good authority that the OPP has placed a padlock on the gates at DCE. This, if correct, could be a significant development. I will investigate, and provide photos, as soon as I return home. Well, will wonders never cease. 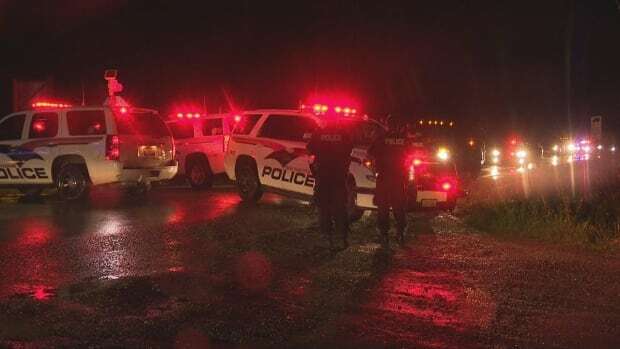 In a nutshell, late last night the OPP moved in with about 50 officers and a "tactical unit" (70 officers in all) at about 11 p.m. and took away most of the debris blocking the Caledonia bypass, citing as the reason, "public safety". The protesters dispersed and no one was arrested. The action was taken with the assistance of the Six Nations Police. Pictures taken on scene by a freelance photographer, as well as details of how the operation unfolded, can be found in the CBC article, "Police dismantling blockade on Highway 6 in Caledonia", 5 September 2017 - click here. "In an updated press release, Ontario Provincial Police said both roads have been reopened to through traffic as of 2:20 p.m. Tuesday". See here for a local perspective, and the view of Councillor Grice of Caledonia in "OPP dismantle Caledonia blockade", The Sachem, 5 September 2017. An excellent video of the events can be found at CTV Kitchener, click here. One item of note is the OPP officer indicating that while to date no arrests have been made, there is an ongoing investigation into any criminal activity that has taken place. Assessment of Role of OPP: The one word that comes to mind is, "finally". I will congratulate the OPP on a job well done. The "protesters" did not seem to understand that they crossed the line when they blocked the railway, and then Highway 6 - neither of those acts can be tolerated. Furthermore the OPP correctly "made their move" after dark. This tactical decision, along with blocking Sixth Line all the way to the Rez ensured that reinforcements could / would not come pouring in as happened in 2006. The telephone tree and social media would not be able to muster much help under these circumstances. Of course this time things were very different in that most Six Nations wanted the barricade gone, and to say the least there was tepid enthusiasm for helping to keep it afloat. Kudos to all. Impact of These Events on the HCCC: This did not end well for the HCCC and supporters (the "protesters"). As a matter of fact they may have "lost face" (the image they wish to convey in the eyes of Six Nations and Government authorities). It ended with the "protesters" or "land protectors" scurrying away in defeat. If history teaches us anything, it is that there is no ability of the Haudenosaunee Confederacy Chiefs Council (HCCC) and their sympathizers to come up with creative, novel solutions. They appear unable to see or understand the wider effects of their actions. Also it is abundantly clear that there is nary a whisker of empathy for the residents of Caledonia - there never has been any. How will this then play out in the long run? Probably at some point soon they will swing into action again, likely using the same old tactics that have "worked" before - blockading Argyle Street South. Like rats in a Skinner box (Psychology 101), they have been rewarded for acting at this one "magical" spot - so this rewarded behaviour is likely to occur again. My dream is that the HCCC has now lost most of its credibility on Six Nations, and will have no choice but to become a ceremonial group dedicated to reminding the people of their proud past, and will work closely and cooperatively with the Six Nations Elected Council (SNEC) in putting forward their agenda. However I know full well that the HCCC is rife with factionalism, and will never give in to reality and acknowledge the legal role of SNEC. Many HCCC chiefships are currently vacant, or occupied by a "chief" not only of the wrong Nation, but the wrong clan. Meetings are frequently cancelled due to a lack of a quorum, or meetings end abruptly when the Head Chief walks out in a huff. How could they possibly take over the efficient day to day operation of a community of 23,000. It is a shame really, because both groups working together would offer strength and continuity. It is not possible to return to 1924 (let alone 1492), and until HCCC realizes this they will continue to engage in ultimately self destructive actions which only tear the community further apart. Severe Lack of Understanding of 19th Century History: Much of what we have seen can be distilled to immense ignorance - on the part of many to most - even the Provincial Government. I can say this on the basis of having searched all of the Six Nations "Indian Affairs Papers" in the Library and Archives Canada in Ottawa, and the relevant documents housed in the Archives of Ontario in Toronto, as well as all the documents at the Woodland Indian Cultural Educational Center (old Mohawk Institute), over the past many years in my quest to learn more about my own family. I believe that only myself and P.M., the SNEC Land Researcher, can make a claim to having completed such an extensive search of all relevant documents. What is vitally important to note is that as shown in the original documents which I have posted to this blog, the original 2006 "reclamation" of the Douglas Creek Estates (DCE) property in Caledonia by Six Nations has no justification except in belief and wishful thinking, and was therefore an act of theft. This parcel and surrounding land was surrendered by 47 Chiefs in Council in 1844. Thus that occupation of the property was unconscionable, as was the original blockade, let alone the explosion of violence and vandalism that followed. Therefore the lands at DCE were obtained by fraud, and the barricade was there as a result of a criminal act. Thus there was no need for the Ontario Government to agree to hand over the Burtch lands in Brant County to any group within Six Nations in order to remove the blockade - this was blatant extortion. So it follows that there was no valid rationale for establishing the 2017 blockade of Argyle Street South; and so the OPP had the responsibility to remove it immediately. The events of 10 August to 5 September 2017 should never have happened, let alone the antecedent actions. Effect on Caledonia 2017: Boiling it all down, we suffered in Caledonia because of "internal strife" (factionalism) at Six Nations, as well as wider ignorance of the facts. We were the victims (again) of the incorrect rationale of the HCCC who are always quick to point the finger of blame at the Federal or Ontario Governments, both of whom are factually blameless in this whole debacle. However we in Caledonia are more "accessible" than either of the Governments in Ottawa or Toronto, so we are the ones who get sucker punched. The financial losses suffered by Caledonia (and Six Nations) businesses is significant, and is a matter of which we will learn more shortly. Residents of Caledonia can confirm that it is a shame that after all we have been through since 2006, the blockade of Argyle Street South was allowed to remain for almost a month - and who knows for how much longer if Six Nations people were not pressuring them to move. Again kicked in the teeth. If others ever want to know what it feels like to be a sacrificial lamb offered up to political correctness run amuck, Government inaction, and police hesitancy to act against Indians, come live on the south side of Caledonia. Our only allies were (are) the Mayor of Haldimand and Council. Every day those at the southern end of town are forced to look upon the derelict, tick infested, moonscape that is the present Douglas Creek Estates site, which was once again the hub of the militant acts. The illegal "occupiers" have destroyed everything on site but left trash and debris within the fence they chose to construct. It is a horrid reminder of all that has happened. For some, particularly those residing nearest to DCE, this is in the category of "post traumatic stress". The stress factor cannot be quantified. I will end this posting on a somewhat upbeat note, garnished with the cruel reality we must endure. The most recent article in The Sachem, 6 September 2017, is entitled, "Caledonia roads open, but police remain on scene at DCE" - click here. One quote is from the optimistic side of things: "It was a refreshing sight for Caledonia residents on Wednesday morning as all roads in and around Caledonia are open for the first time in over a month". On a more sobering note: "a police presence of two cars remains outside the fenced gate of the Douglas Creek Estates property". So while all is well for the moment, the OPP are well aware that at any minute the "protesters" are likely to drag that pathetic purloined piece of Hydro One property across the road and once again trigger the whole blockade process. This is all part of the "background" to life and living hereabouts. We live in Caledonia, an idyllic town situated along the historic and beautiful Grand River, but the prototypical example in Ontario of a community distressed due to recurrent extended periods of lawlessness. It is really very hard to live this way - with the "sword of Damocles" hanging over our heads - "when will it drop next?" Addendum: The most comprehensive coverage of the matter, particularly the details of the removal of the Highway 6 bypass blockade, can be found on the CHCH News in Hamilton of 5 September 2017 (but posted 6 September), entitled "Caledonia Blockade cleared" and can be found here. Note at the end of the clip, the ominous statement from the "protesters" ensconced behind the fence gates at DCE (where once again the old tower was dragged - this artifact is fast becoming a museum piece with its own story to tell). Sometimes we wonder whether any outside Caledonia, say media people, really understand what is truly percolating under the surface. There is a very good article, "Scott Thompson: Caledonia gets town back, for now" in CHML (audio and blog) of 6 September 2017 - click here. Clearly Mr. Thompson can see to the root of the problem and how Caledonia is merely a pawn in other peoples games. I get the sense that the media in general does understand that this present situation has nothing to do with land claims, and everything to do with internal politics at Six Nations, and that Caledonia is being victimized by those who would hold the town hostage to meet their own arcane goals. Clearly a step forward.